[portfolio_slideshow] Emerging designer Aria McManus likes to combine the practical with the unexpected. A Parsons graduate and conceptual designer, her work has been featured on Core 77 and honored at the American Design Club's Raw and Unfiltered juried show. For her new line Bodega Bag, like the name says, she sources materials from New York corner stores. 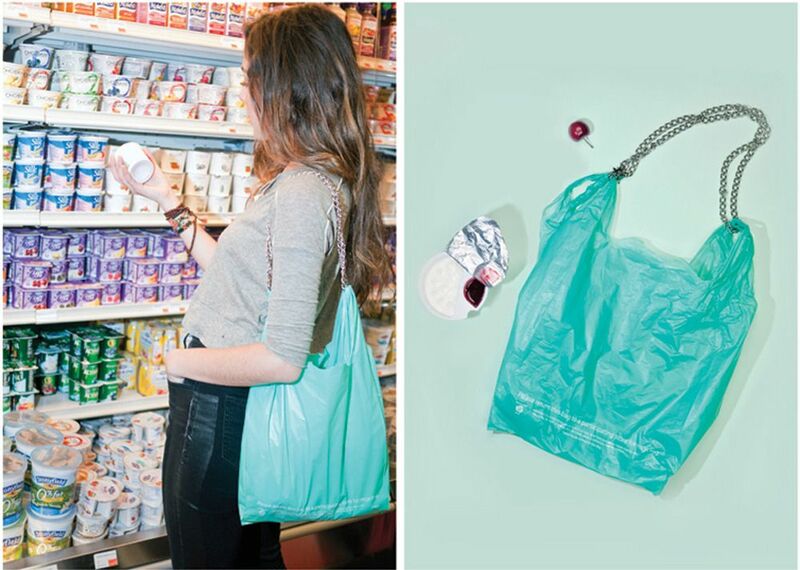 Made from two plastic bags to provide ample support and a nickel plated silver chain, the Bodega Bag is eco-friendly and also comes with interchangeable red, black, white and turquoise replacements which represent colors of different neighborhoods in the city. Aria tells us, "I always thought of the simple black bag as such a beautiful object. It always looked too elegant of a material even though it's thought of as extremely cheap and disposable." Now taking a New York staple and giving it new meaning, this avant garde take on the plastic bag provides an authentic slice of the city in one clever, sustainable accessory. Learn more about this made in New York label at Bodega Bag. Welcome to September: The Fashion Calendar is Here!